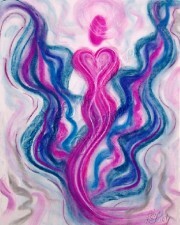 The Angel of Abundance reminds us that the Law of Attraction is in action at all times. Similar to the Law of Gravity, it just is. With that in mind it is important to note that you can only attract things into your life that are in alignment with your current emotional state or vibrational frequency. So not only is it important for us to watch our thoughts, we must monitor our emotions as well. She explains it like this, “If every thought is a prayer, every emotion is an even stronger prayer.” To attract unlimited abundance into your life you must be vibrating at a high frequency. Let the Angel of Abundance help you raise yours now. Let her help you “eliminate negativity” focus on desires instead of fears “practice the fine art of forgiveness” and most important of all, let her help you adopt an attitude of gratitude. 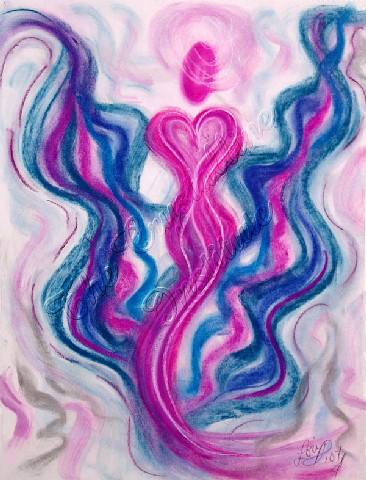 This beautiful angelic artwork, was created by Visionary Artist and Angel Communicator, Lori Daniel Falk, to help you “eliminate negativity”, focus on desires instead of fears, “practice the fine art of forgiveness”, and most important of all, help you adopt an attitude of gratitude. Pastel Chalk on paper.